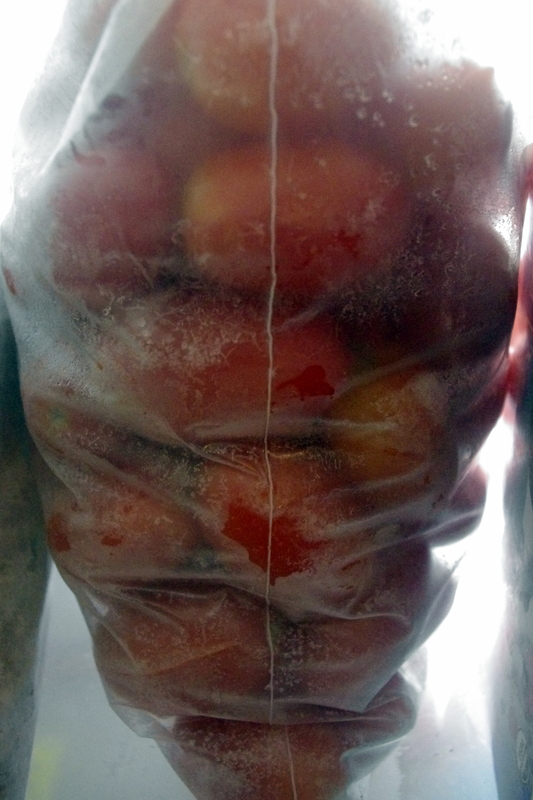 Three gallons of frozen tomatoes is a bit much. So the moment POD’s red peppers were actually red peppers, they were cooked. Inspired by a recent menu option at Lockeland Table, five pounds of plum tomatoes, 10 oz of red peppers, two bulbs of garlic, and a generous handful of basil formed the foundation for a pretty darn yummy dinner featuring homemade cavatelli with roasted tomato, pepper and garlic sauce. And, I have to say, the homemade cavatelli hit the spot, as quite inconveniently, our pasta maker died just prior to our departure from the pasta heaven that is South Philly. It’s easy (hot, but easy): Preheat the oven to 400. Brush some olive oil on two-three bulbs of garlic (yes, two, maybe three, entire bulbs) and roast them for 40 minutes. 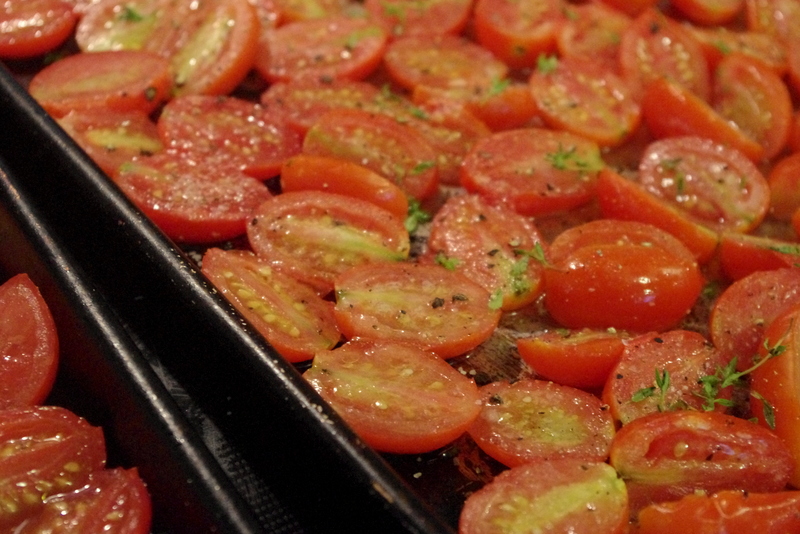 Reduce heat to 35o and stick two baking trays of tomatoes in there (you’ll have halved and painted the tomatoes with olive oil while the garlic is roasting) for 45-60 minutes. You’ll want them to be good and smushy. Remove the tomatoes , crank the broiler to 13 and placed your quartered and seeded peppers in the fiery inferno. Which is to say: broil your peppers until the skins are black. Placed blackened peppers in a plastic baggie. 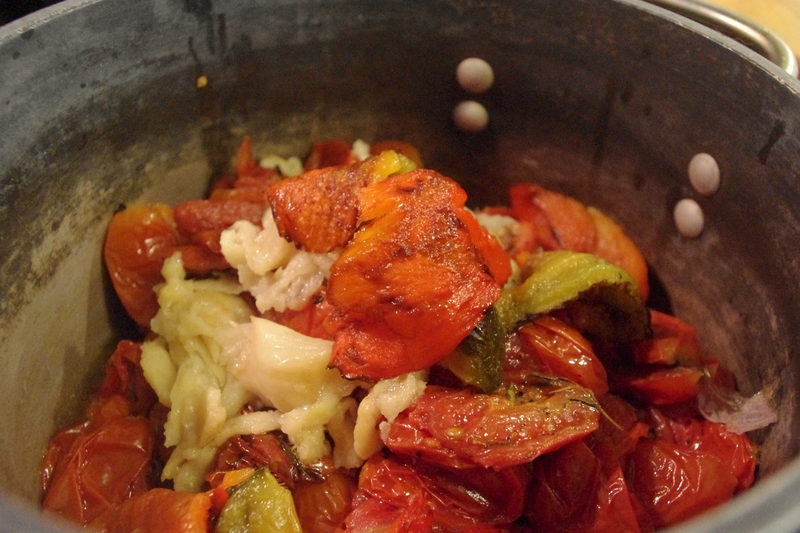 While the skins are steaming off, scrape the tomatoes into a saucepan, squish the roasted garlic over the tomatoes, skin the cooled peppers and toss ’em in. Add a couple of tablespoons of olive oil, a handful of basil leaves, and a splash of balsamic vinegar to the pot. Using an immersion blender (or blender or food processor), whiz until smooth. Season with salt and pepper and warm that roasted deliciousness up and serve over pasta of your choice. The mighty cucumber is no more. After producing at least 100 fruits the workhorse was retired. Anyhoo, rutabagas are a new addition to the POD lineup. According to the UGA Extension, this turnip-like brassica is easy to grow and needs to be planted about 60-90 days prior to the first heavy frost. At 75 days, we’re good. Also on deck? spinach, carrots, daikon radish, and a second attempt at zucchini. All of which (with the exception of carrots) are new for POD — and the notion of a fresh start in August helps alleviate the sting of back-to-school sales, shortened days, and cool pre-fall nights. East Nashville’s Tomato Arts Festival may already be history, but the tomatoes here at POD are in full, glorious swing. Mr. Stripey, you are delicious , but you do not work so well. Planted on May 9 this plant never had the vigor of the two hybrids planted in the front. I think the religious applications of Tomato-Tone have been the saving grace. Thus far, one fruit has been harvested and although it looks like a few more will make the cut, next year it’s time to look into a different variety. I’d be willing to give another indeterminate a shot here, though. 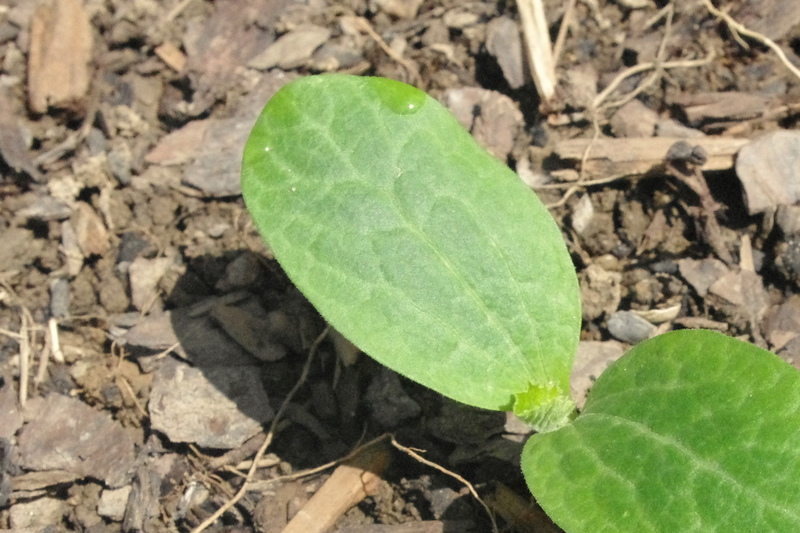 Next year, consider planting tomatoes towards the back of the planter — because even though the leaves never quite hit their stride, the plant’s height shaded the bush zucchinis that resided behind it into soggy oblivion. Also, figure out a better staking method! the 42″cages were so not up to the task. And finally, alas, tomatoes that are low in acid must also be part of the equation. Mike McGrath has some great suggestions on this front. Because I had a couple of extra starts, I decided to hack out a swath of garden along the southeast side of the back yard, because why not? 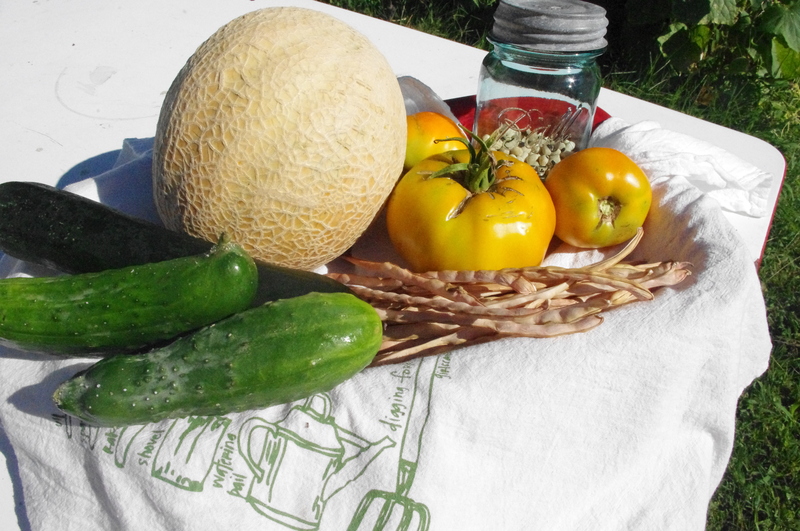 It’s largely devoted to herbs, but we threw a couple of tomatoes and a watermelon out there, because why not? Aaaannnd, forgetting entirely that I, you know, blog about the garden from time to time, I manged not to note the exact variety of yellow tomato that we planted. Or when, exactly, I planted them. (Around Mother’s Day?) But hey, we currently have a dozen of these sweet guys taking up precious kitchen counter space! We’ve gotten three Mr. Stripeys off this plant, but we’ll still be in the market for a new pet next year. Also? STAKE AND TRAIN THEM BETTER!! It would figure that in PODs version of shattering a bottle of champagne on the bow, tomatoes would christen the new land. Hastily purchased at the Home Depot and planted just hours after signing the papers on POD 2.0 (in mid- to late-April) the Juliet plum and Husky Cherry Red tomatoes went absolutely crazy in front of the house. So crazy, that the indeterminate plum totally overwhelmed the cage is hanging kudzu-like over the cherry laurel and spilling onto the porch. Not good for the laurel, very good for the tomatoes. So far, we’ve stuck about 10 lbs of plums in the freezer and the rest have rounded out the Hurricane’s lunches. The Juliet is just about the perfect tomato for lunching and saucing. I’m not totally crazy about the Husky’s flavor, although production is impressive enough. Next year, select sweet determinate plants for the front and position them as close to the lawn as possible — they’ll eke out a few more minutes of sun and will be infinitely easier to harvest. These are the Hurricane’s tomatoes, so make ’em sweet and small. There have been a lot of role reversals around here. Instead of being the weekend cook, the gardener has become the weekday cook and the Endurer rules the grill on Saturdays and Sundays. And, as my emerald green and abundant sorrel was about to be attacked by rogue, poorly staked tomatoes, I figured it was time to experiment with the newbie in the herb patch. Plus, we have leeks! And tarragon! And parsley! Oh, my! Which led us to this amazing sorrel soup. Which, in itself, is a bit of a reversal as I am not generally the one who cooks French-inspired foods (or soup). And, in the backhanded compliment department, the Endurer raved about this tangy, silky soup for days, calling dibs when leftover night rolled around. Melt butter in a Dutch oven over medium heat. Add the leeks (or onion, ramps, or green onions) and potato and turn the heat to medium-low. Cover the pot and cook gently for 10 minutes. While the leeks and potato are cooking, pour the stock into another pot and bring to a simmer. Increase heat to medium-high, add the sorrel leaves and a healthy pinch of salt and stir well. When the sorrel is mostly wilted, turn the heat back to medium-low, cover and cook 10 minutes. Stir occasionally. Whisk in the hot stock and herbs and simmer for 15-20 minutes. Reduce heat to low. To finish the soup, whisk together the egg yolks with the dairy or non-dairy of your choice. Temper the yolk mixture by ladling a little soup into the eggs with one hand, while whisking with the other. Repeat this three times. Whisk the mixture into the pot and cook below a simmer — for a couple of minutes. Do not let it boil or the soup will break. Puree the soup with an immersion blender, season to taste with salt and pepper. It should be rather thin, but feel free to add a little flour to thicken or extra stock to thin. After years of disappointing yields, POD is swimming (or drowning) in garden-fresh produce. What a deliciously beautiful thing. My days as a container gardener were rewarding, for sure. 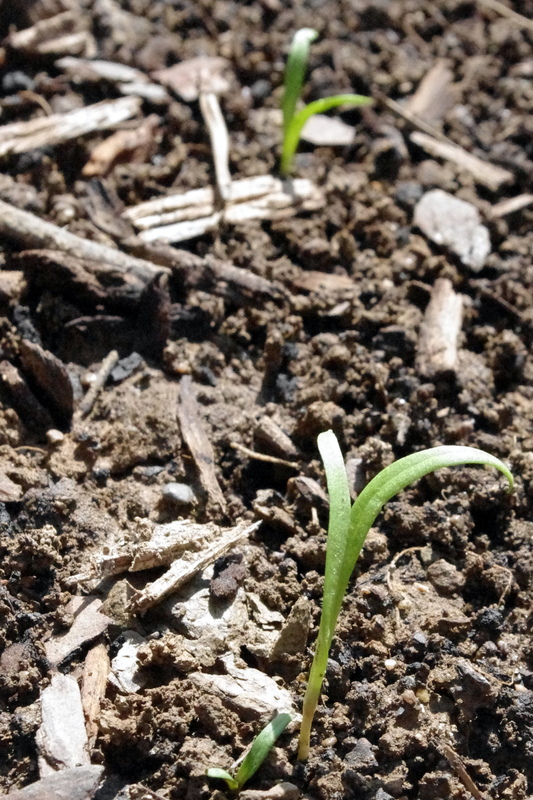 I loved pushing seeds into the soil with the Hurricane’s tiny fingers assisting, we loved watching those tender shoots push through the deluxe organic-by-the-bag soil, and we loved June. We loved how healthy and vibrant the young plants looked, we loved the possibilities and the promise, and we loved having the only garden on the block. Heck, one of the only gardens in all of Pennsport. For all the pleasure, those days were also pretty demoralizing. What I didn’t love so much? July and August. And aphids. Given the scarcity of delectable gardens in the neighborhood, each and every pest and squirrel came a’callin’ each and every year. Still, we managed to eke out enough of a harvest to come back for more, year after year, but only barely. And on the menu for this week? And on the shopping list? Lamb and Surryano and not much else.